I'd rather sew than exercise. That's nothing new. My near-new trainers which I got two months ago to play volleyball in are sleeping in a deepening dust pile. Must jog sometime soon! Next weekend maybe? Either way, the weekend hasn't been a loss. 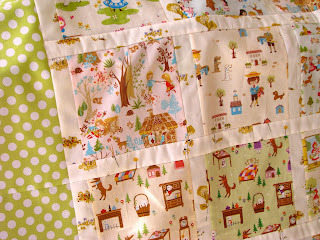 I plundered my inordinate hoard of fairytale japanese fabrics and finished this cute quilt top for the kiddo's toddler bed. I originally collected these to put as trim on smocks, back in the days when I sewed baby smocks. Seems so long ago. And she really needs a bigger quilt. 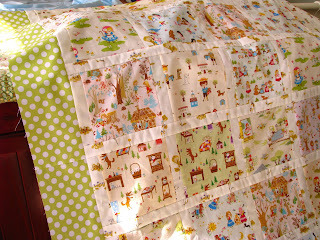 I just need to get some spotty flannel for the back, then send it away to be quilted. 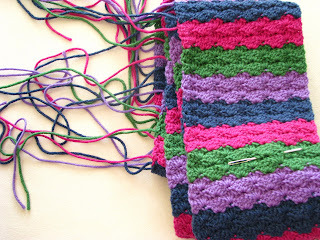 Now, I'll retire to that worn-in dip in the couch to weave in these ends. So maybe not so lazy, hey? Hope your weekend is good, too. Mine's the top banana.